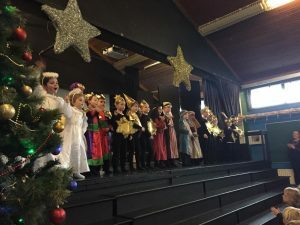  » 2018 » Archive by month "December"
“You’re Under Arrest”…..in Ms. Olson’s Senior Infants! Our theme for the month of November was ‘Jobs’ and what an interesting month it was! In Aistear, we had a Garda Station role play corner which we really loved! We had to answer all the 999 calls and dispatch the guards to different situations. We had a Garda car to take us to those emergencies and we even had a cell to hold the prisoners! We also had to fill out incident forms and take finger-prints. It was a lot of fun! 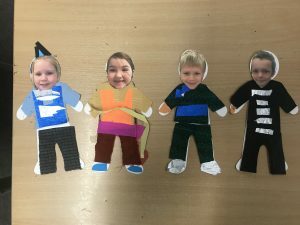 We also made Emergency Services puppets in Aistear. We made Guards, Mountain Rescuers, Paramedics and Firefighters. 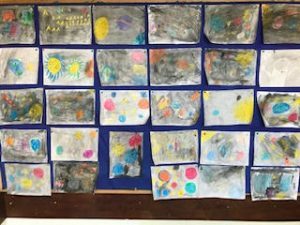 Take a look at our creations! 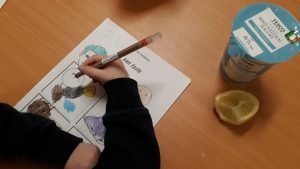 In Literacy we read and did lots of work on two different stories related to our theme – ‘Lost and Found’ by Oliver Jeffers and ‘The Little Red Hen’ by Michael Foreman. These stories show how people help us. In ‘Lost and Found’ the little boy helps the penguin find his way home and in ‘The Little Red Hen’, the hen makes new friends who help her to make bread. 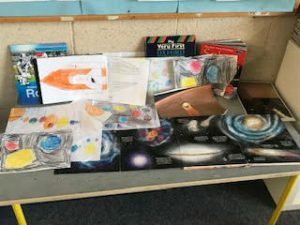 We spent a lot of time developing our comprehension skills such as predicting, questioning and summarising when reading these stories, as well as analysing and dramatizing the feelings of the characters. We also wrote a of list of things we thought the little boy and the penguin might need on their trip to the South Pole! 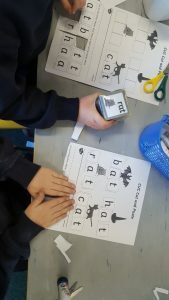 In S.E.S.E we learnt all about jobs. 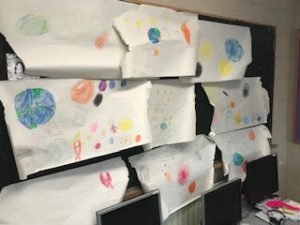 We realised that there are so many different jobs that people do in the world and we had a think about what we would like to be when we grow up. We also learnt about the Emergency Services and the different work that they do. Probably the most interesting part of our month was when we devised questions to interview our parents about their jobs. We practised our interviewing skills in school beforehand by conducting mock interviews in pairs and then we interviewed our parents for homework. We loved hearing about the work that our parents do and we want to say a big thank you to our parents for letting us interview them! In Music, we learnt lots of songs surrounding our theme such as ‘What shall we do in our work today?’ and ‘Harry was a fireman’. 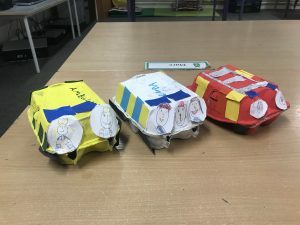 In Art, we made Emergency Services vehicles out of egg carton boxes. Take a look! 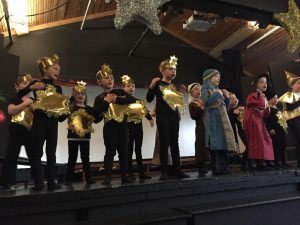 Finally we were busy preparing for our Christmas play – ‘What a Star!’ which we performed for our parents in early December. 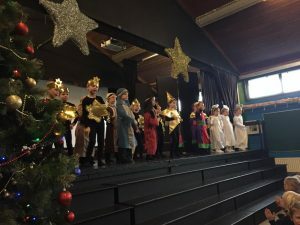 We did a fantastic job and everyone was so proud of us! 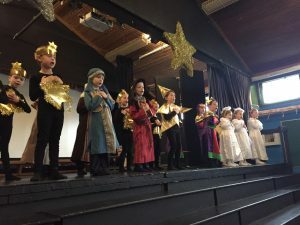 Here’s a sneak peek of some of the pictures from our dress rehearsal. More to follow on our next blog post! Thanks for reading! 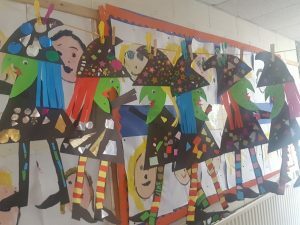 Category: Senior Infants, Aistear, S.E.S.E, Art, Drama | Comments Off on “You’re Under Arrest”…..in Ms. Olson’s Senior Infants! 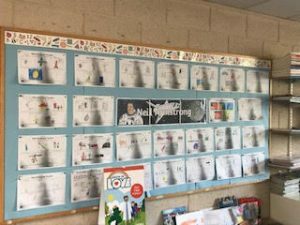 October was a scary month in Ms Woods Junior Infants class. The children opened their own fancy dress clothes shop and there were witches, ghouls and wizards everywhere. They were even writing their own spells in a spell book. Some witches were hanging around the corridor outside our door. 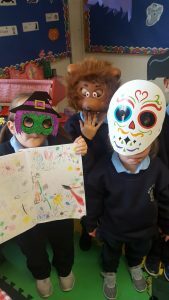 We had witchy stories and poems and we were learning lots of new words from Oiche Shamhna in Bua na Cainte. We were learning lots of new things while having a great time. 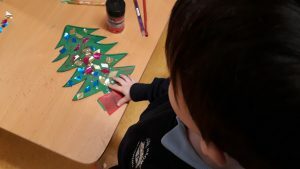 We have been very busy and having fun here in Junior Infants, even though we are missing Ms Walsh. 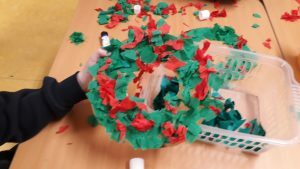 Here we are making or Christmas trees and wreaths, you will see them outside our door when you are coming in to school. 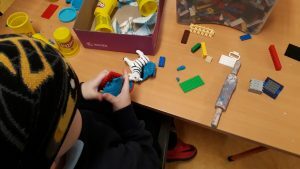 We are also hard at work playing with lego and playdough. In SPHE we have been learning all about different tastes, like sweet, sour and salty and deciding we we like, and which we don’t like. 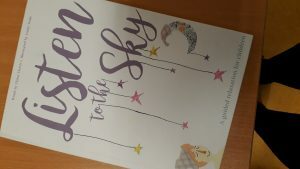 We have been doing some relaxation with the book Listen to the Sky which we all really enjoy and feel very relaxed afterwards. Thanks for reading this and see you at our play – We can’t wait!